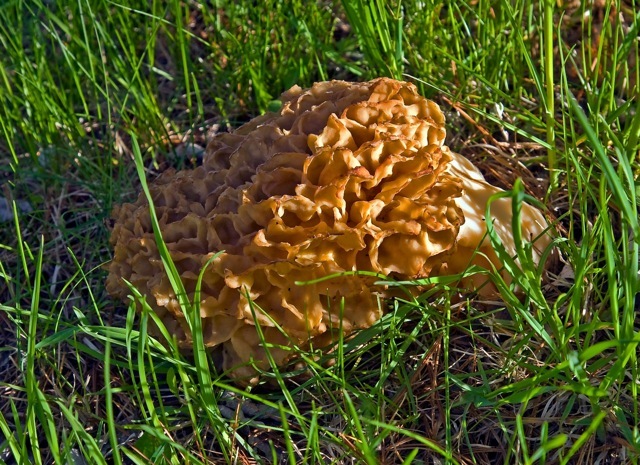 From Cub Reporter Babs Young: I’m not a big morel hunter or eater, but driving down my driveway the other day I found seven of these in my flower bed. That is the first picture below of three. There were seven more, but I will spare you the pictues of these. I heard from Chris, too: This is the largest mushroom I have ever seen! Weighed it at the store for proof, too. OK, so I am going to breakfast at Sonny’s bright and early Monday morning. I think I’ll order a grilled morel steak with crispy hashbrowns on the side. For those of you from Away, morels are the sacred wild mushrooms of the Michigan Peninsulas, celebrated in song, story, and folk festival. This year’s Mesick Lions Mushroom Festival, scheduled for May 7-9, was called on account of stupendously lousy weather, but the Mesick Lions are not ones to give up. They are holding the Great Do-Over on June 11-13. I am so impressed with their never-say-die spirit that I believe I’ll go over there for some pasties and some mud throwing. 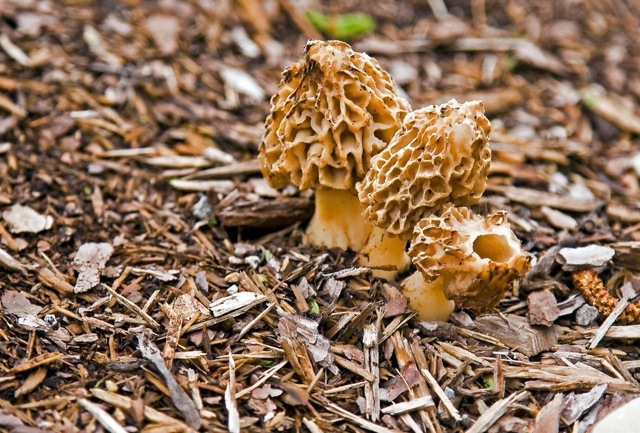 The National Morel Mushroom Festival was this weekend in Boyne City. I’m sorry not to have sent you over there earlier, but I’ve had a lot on my mind. Go to the website anyway. Those of you with decent internet service can hear The Mushroomers Waltz by Robin Lee Berry. ← Playing with fire. Also stones and water. That’s a mushroom. And L A R G E ! I have been looking for morels for years. No luck yet. So we will have to do with the Yellowfoots. They are very good dried as ‘mushroom-spice’. They are attractive. To my best knowledge there are no similar looking mushrooms. At least not here in our part of the world. I’ll try and ask some of the people who knows for sure. I know a little piece about mushrooms. I havent tried to translate it with English rhymes. If you are picking in unidentified fungi in the woods. So first let little brother taste them. And if nothing happens with the little? Well, then the portion of mushrooms was wasted. Carsten! You must be the oldest child in your family! Heh heh. Me too. The most amazing part of this story isn’t even that Chris and Sonny found the huge mushroom. It is that they told where they found it! You know the sad thing? I overslept and did not get over there for breakfast at all. I had cereal and milk. Bleah. This picture really doesn’t do this mushroom justice, you still need to come see. I don’t mind the fact we told where we found it. If you go there, please check out the BEAUTIFUL Wisteria growing into the fence too. I wish it were at my house instead as no-one really sees it there. It should be fully in blossom in the next few days. I will have to go see the wisteria. Who knows, maybe I’ll stumble on a mushroom. If I can manage to get a good sleep tonight I will definitely have breakfast over there. There’s nothing to eat at my house except smoked trout and carrots. Lunch, maybe. Breakfast, naaahh. We went to Traverse City yesterday and found a couple of urban morels while walking our dog. Actually, we found four, but two had been stepped on. None in the woods at home this year. Breakfast? That quarter of a fresh apple is wearing off, and you’re all making me hungry now! Ah, but now it’s time for lunch! I believe I’m going to have scrambled eggs with salsa. Yes, I am. I just checked, and my only other choice would be more cereal and milk. For someone who works at the Eastport Market I am curiously inept at keeping food in the house. Fortunately there are lots of other places a person can eat besides my house. 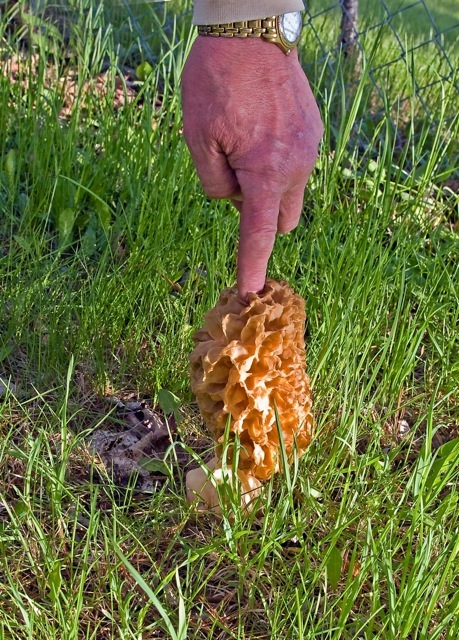 It’s hard to accidentally eat a morel, as no one has ever figured out how to cultivate them. Since they’re hard to come by, people tend to let you know they’re sharing a treasure with you! I did go to Sonny’s for breakfast and Chris brought out the Mother of Morels. We measured it and it was about 9 inches long and almost 5 inches wide. 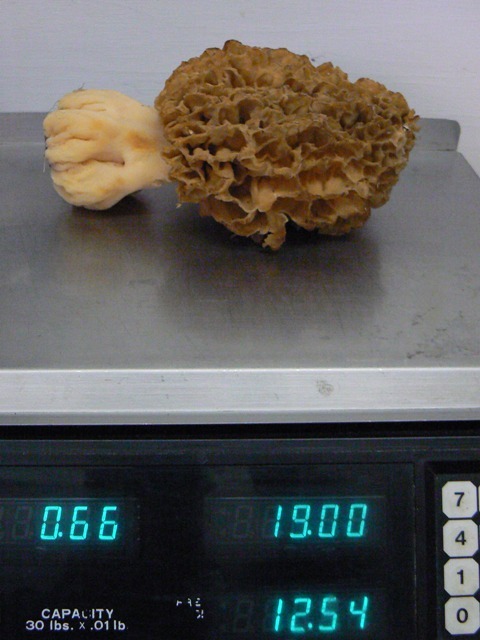 I’ll have to Google for records for giant Morels. By the time I get over there the Mother is likely to be a wizened dried morel. Perfect for soup. Being from Away (I thought this was an exclusively Nova Scotia/Newfoundland expression) I have lived most of my life in the dark where morels are concerned. Thanks for enlightening me on a subject that Kathy of the UP also seems to salivate over at this time of year. I am fond of stealing useful expressions anywhere I find them. It is entirely possible that I adopted “from Away” from hearing it on CBC. But I think it came from spending time on islands in the Great Lakes. Living your life in the dark where mushrooms are concerned is generally an advantage, rascal, but in the case of morels, not so much. They pop up in nice sun-dappled areas.